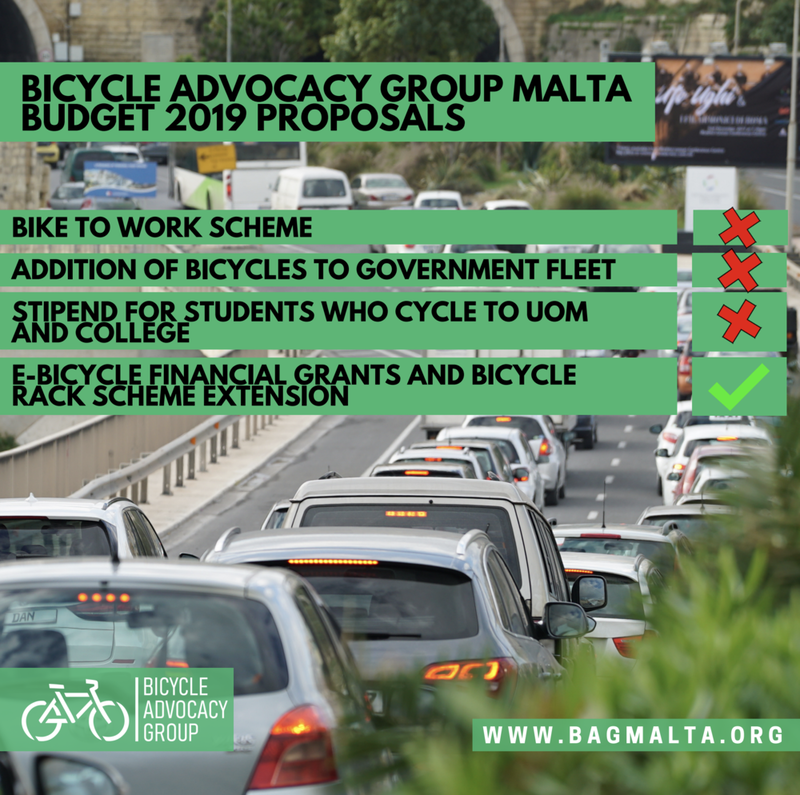 The Bicycle Advocacy Group (BAG) observes that there is a lack of sustainable and political will to embrace measures to reduce car traffic in the budget which was just presented. Road widening is a short-term approach that is costing taxpayers millions of euro every year and will continue to burden future generations with more problems of congestion, pollution and overall poor quality of life. Road widening only serves to invite more cars on our roads, thus rendering the initial widening useless once full capacity is reached. The Bicycle Advocacy Group is disappointed that only one out of its four proposals focusing on financial incentives to encourage cycling have featured in the 2019 Budget. BAG welcomes the extension of the e-bicycle €400 grants and provision of bicycle racks for Local Councils and companies. However, without the planning of safe bicycle infrastructure to complement it, it will be difficult to get people to commute by bicycle in greater numbers. Furthermore, no budget has been allocated to this grant, and thus BAG asks whether any limit to this grant has been removed for the coming year. 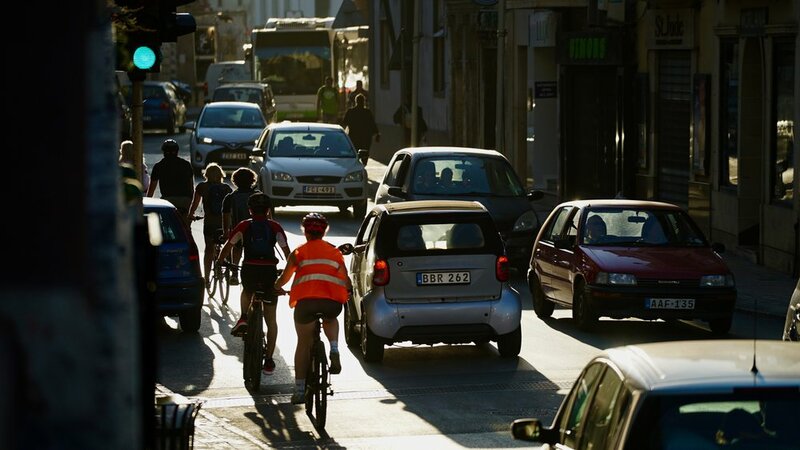 Bicycle Advocacy Group asks what proportion of funds from the €100 million allocated for road works during 2019 will be allocated to the creation of cycle lanes and green infrastructure. While the government is encouraging developers to invest in parking and parking facilities, BAG points out that such initiatives are built on the US approach which led to the creation of inner city parking lots in the 70s and 80s, now branded as one of the worst urban planning disasters in the US. Parking lots only encourage a further increase in car use, that would lead to further congestion and pollution. Parking lots in urban areas are an eyesore to a city’s landscape, lower the quality of neighbourhoods, and increase rainwater surface runoff and therefore the potential of flooding. An increase in the number of parking lots will create an emptiness that further divides our towns and villages, discourages community integration while making it increasingly difficult for people to travel without depending on private vehicles. This is unfair on those that cannot or choose not to drive, for environmental or personal health or financial reasons. In 2019, the focus must be on the creation of green open areas in our crowded urban towns, and green infrastructures that encourage active commuting. BAG reiterates that if we’re serious in promoting alternative modes of transport, we must actively and equally discourage private car use as much as possible. Only then will we be able to see an effective modal shift which our society can equally benefit from.